My Home and Garden: DIY Laundry Soap Recipe. Easy!!! Works like a charm. DIY Laundry Soap Recipe. Easy!!! Works like a charm. We have done several loads of laundry using the new DIY laundry soap. I have seen dozens of recipes. This one appealed to me. It looked easy and uncomplicated. You only have to use 1-2 TBSP of soap per load. They really mean it. It is very concentrated and that really is all you need. You also don't get the suds of commercial laundry soap. You don't need suds to get clothes clean. Who knew!!?? 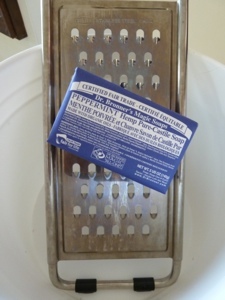 1 bar of Dr. Bronner's or another type of pure Castile soap. Grate the soap bar, or cut into small chunks and powder it using a food processor. In a large bowl mix the soap, borax and washing soda together well. Pour the mix into a small bucket or jars with a tablespoon to measure out the soap. Remember only 1-2 TBSP per load. This recipe looks very easy compared to some of the ones I've seen. How warm do you need the water to dissolve the soap shavings? Was the soap hard to find? I use the other two ingredients in my wash already. Hi Joan. I use warm water to wash the laundry. It melted the soap just fine. I found that I needed to go back to using warm water, cold rinse when I started using natural soap. I got the Dr Bronner's bar of Castille Soap at our local health food store. I can't find Fels Naptha in Canada. I'm going to bring some back next time I'm in the US. In the meantime, I would email Dr Bronner's and find a store close to you. I did some research and Fels Naptha is not a natural soap so I won't use it. Dr Bronner's or some other pure soap. Castille is perfect.